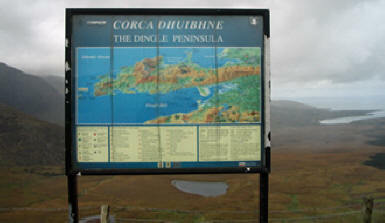 We drove back east through County Galway, making our way to Dingle. 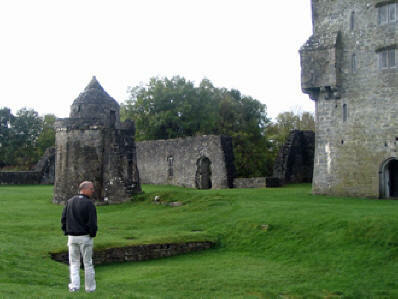 On the way, we stopped at Aughnanure Castle. 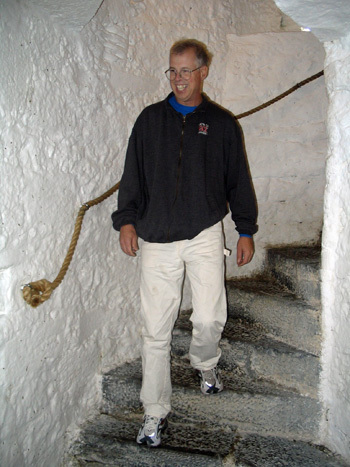 The castle had undergone extensive restoration, so we were able to go inside and explore all the way up to the top. It was fun to imagine what it would have been like living there. 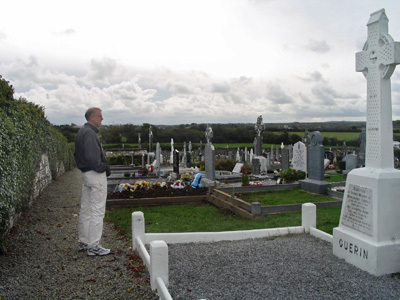 We left Aughnanure with some reluctance. Down to Kilimer we drove, to catch the ferry over to Tarbert. While we waited for the ferry, large crows (ravens?) stood around next to the cars waiting for people to toss them French fries and other tidbits. 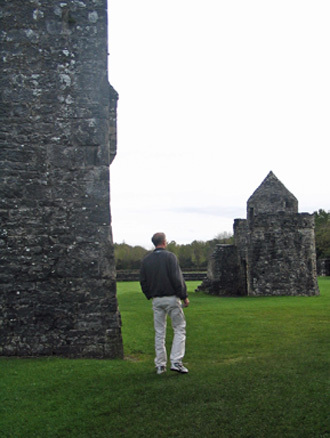 We visited the Lislaughtin Friary. It was interesting how modern burial plots were still being put in amongst the ancient ruins. 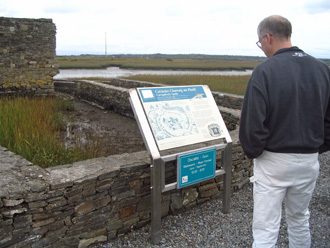 Sue's quest to see every ruin and castle along the way brought us to Carrigafoyle, on the banks of the Shannon estuary in County Kerry. 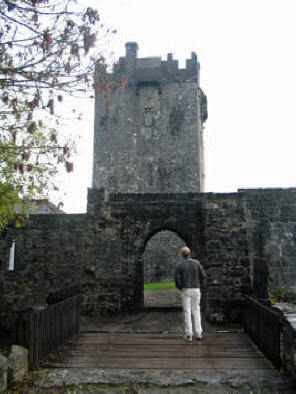 This castle was built by O’Connor chieftains in 1490. 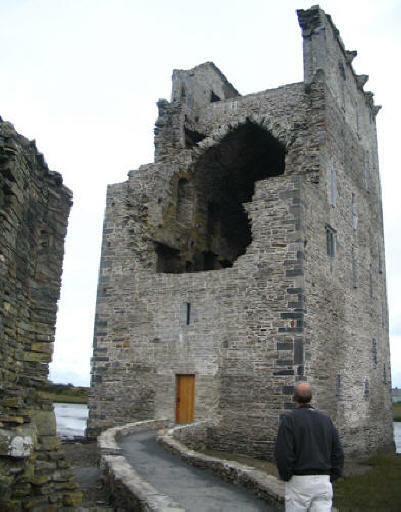 It was considered to be especially well constructed, although apparently it didn’t hold up to a series of sieges in the late 1500s. 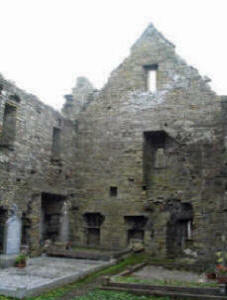 The missing wall allowed a good view of some of the castle’s interior features. 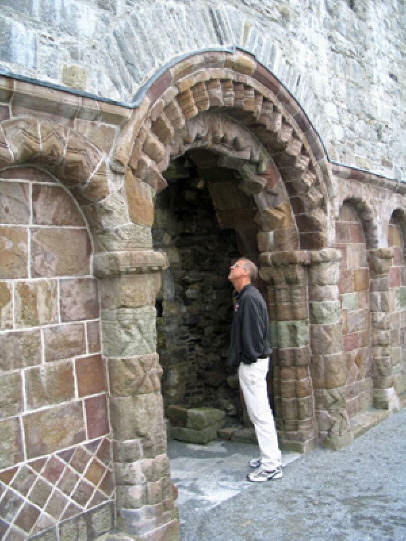 It had vaulted ceilings, spiral staircases, and secret (or hidden) chambers. We could see a spire in the distance. It wasn't a church spire. 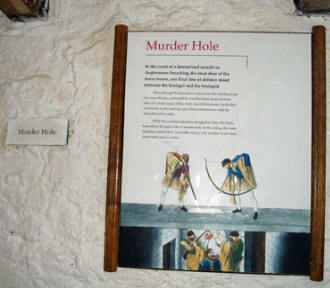 We drove closer to investigate. 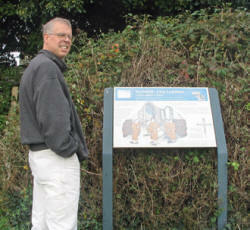 We had to go through a cow pasture or two, but it was worth it to check out this fascinating structure. 1,000 years old and still standing! This tower is felt to be “oddly sited” because it’s outside the wall of a church and in a farmer’s ploughed field. Amazingly, the farmer gets away with ploughing to within a few feet of the base of the tower. 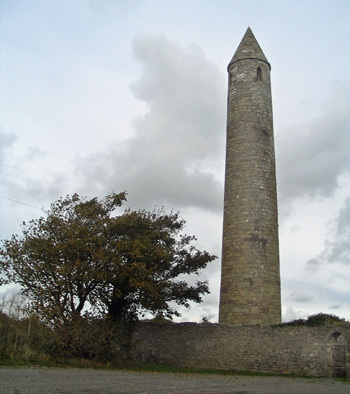 Apparently, there are a number of these towers scattered around Ireland. One interesting theory posits that, rather than being religious symbols, places of refuge, or watch towers, these structures were built as amplifiers of radio resonance from the atmosphere (generated by lightning flashes around the world). Support for this idea is drawn from the height of the doors, which are usually 5 to 15 feet above the ground, where the frequencies are supposedly strongest. It’s believed that those who meditated at the optimum level were imbued with resistance to infections. We were unable to test this theory. 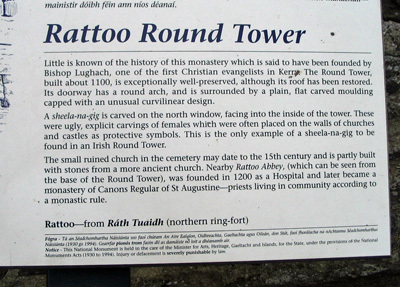 A monastery was founded near Tralee by St. Brendan "The Navigator" in the 6th century. 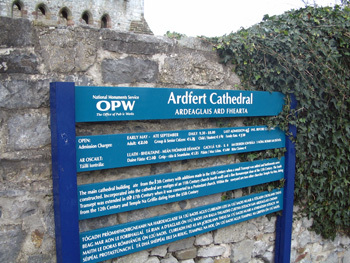 There are three medieval churches, an ogham stone, and a number of early Christian and medieval grave slabs on the site. 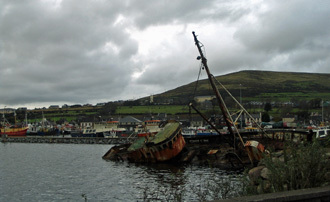 St. Brendan is credited with having sailed to North America centuries before Columbus. 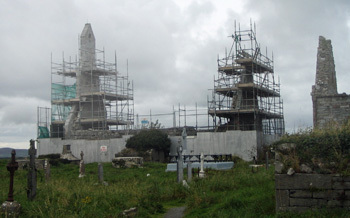 Parts of the old church were under (re)construction. Back on the road again. There were a couple of ways to get across the Dingle peninsula. We opted for the more scenic Connor Pass. It was made doubly exciting by all of the road construction we encountered. 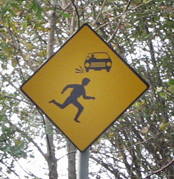 The already-narrow roads were not improved by the loss of the "verge." 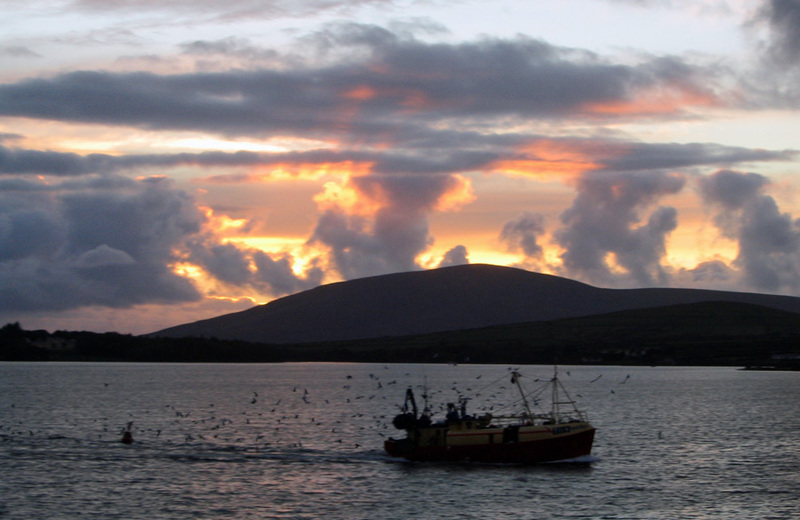 Our first view of Dingle Harbour. have been in his price range. A spectacular sunset, seen from the window of our room at Emlagh Lodge. Note the seagulls following the fishing boat.